This flagship A3 four in one colour multifunction printer offers outstanding performance to streamline workflow and increase productivity. Colour A4 copies and prints are generated at 20 a minute. Job throughput can be further enhanced with the optional internal finisher featuring stapleless stapler for binding up to five pages without using a staple. Fax remotely with the built-in powerful G3 remote fax. Operation is simple with the optional touch and swipe panel is similar to smart phone and tablet devices. 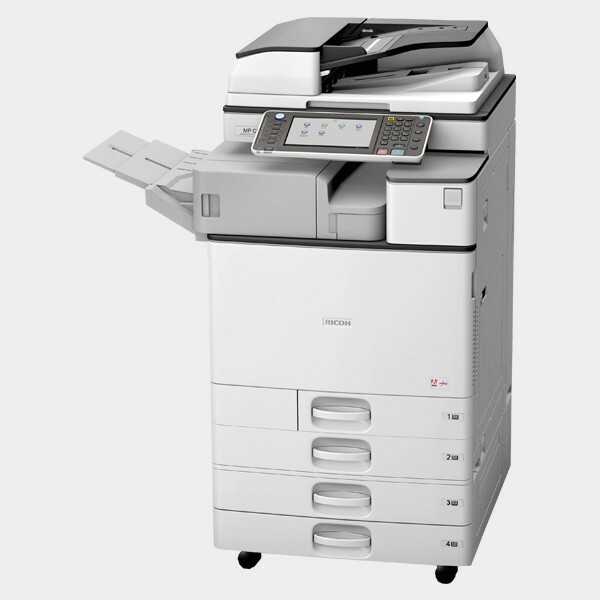 Allow a fresh blast of productivity to sweep through your office with Ricoh’s new-generation flagship A3 colour MFP. Increase your workflow with its built-in finisher, stapleless stapler and smart card reader. Save time with its short warm-up, fast first print speeds, ID Card Copy and Searchable PDF. At the same time, reduce your environmental impact through a low power consumption, quota setting and adjustable power on/off settings. In short, the MP C2003SP/MP C2003ZSP/MP C2503SP/MP C2503ZSP will meet all your digital workflow needs and help you become more productive, day in, day out, in an environmentally responsible manner. The MP C2003SP/MP C2003ZSP/MP C2503SP/MP C2503ZSP are designed to streamline your workflow and increase your efficiency via performance and easy usability. You’ll find yourself becoming much more productive while producing professional document output that you never thought possible. The Ricoh philosophy is to provide the highest performance with the lowest environmental impact. The MP C2003SP/MP C2003ZSP/MP C2503SP/ MP C2503ZSP are supreme examples of this approach. Power consumption during operation is lowest in class. Sleep mode saves even more energy. The use of toner and paper is efficiently managed to save resources. Recycled and bio-plastic components are used wherever possible. These devices take ease of use to another level. Their optional touch and swipe panel is similar to iPad and Android devices to make operation simpler and faster. Operation is the same as other Ricoh MFPs, which reduces training needs for fleet customers. Save time by presetting frequently used settings on the home page. Slim and stylish, these attractively designed multifunctionals will enhance the appearance of any office without taking up too much valuable space. They are also extremely quiet. Cleverly designed housings reduce the noise of moving parts. Fans stop operating during sleep mode. And after waking up from sleep mode, parts that don’t have to move – don’t! These MFPs support the increasingly popular SRA3 format, so you can print crop marks for easy and efficient proofing. During simplex operation the devices take paper of weights up to 300g/m² (duplex = 169 g/m²). Printing on envelopes is easy with a standard envelope feeder available from the second tray. Cut out unnecessary and frustrating time spent looking for documents by using the Searchable PDF function. You can even search for a document by inputting a single specific word that appears in the text. Fax remotely with the built-in powerful remote fax. Print from USB/SD, or make full use of the built-in Smart Card Reader. Simultaneously copy both sides of an ID card onto one side of paper with ID Card Copy. food) as well as to hospitals and schools (no risk of injury to patients and children). Create stunning, professional documents with the internal finisher. Increase total capacity by attaching a 1-bin tray to the top of the finisher, without increasing the unit’s footprint. Real-time process control stabilises image colour density to produce breathtaking image quality. Vibrations are ruled out, preventing banding and making images look perfectly smooth. Text sharpness is high and the risk of halo formation is low. Colours can be easily adjusted; ‘before’ and ‘after’ pictures enable you to easily fine-tune images for optimal results. and an information screen. Distributed Scan Management allows scanning conditions and destination to be set automatically again saving time and improving efficiency. Real-time jam animation speeds up troubleshooting, while an innovative mechanism ensures smooth paper loading. TEC values of these devices are among the lowest in the sector. Power consumption during sleep mode is also an industry low. At a glance you can see how much paper you have saved via animated indicators on the operating panel. Adjust the power on/off setting so that the device is ready to start working the minute you come in – and goes to sleep as soon as you clock off. The use of bio-plastics and electric furnace steel reduces the ecological footprint of these devices. Field Based Engineers Will Be With You Within 4 Hours. Remote, Interactive, Diagnostic Support Tools. We Offer FREE, No-obligation Quotations. Enter your email address to request a free quote and we will get back to you today. ©Copyright 2017 Photocopier Warehouse. All Rights Reserved.